Men and women at war with unwanted, unsightly and embarrassing hair know that waxing, shaving, tweezing, and hair removal creams offer only temporary solutions, and painful time consuming electrolysis can only treat small areas at one time. 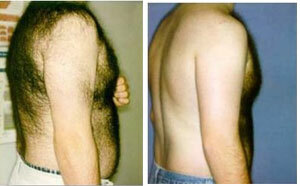 For many people, laser hair removal has become the system of choice. This non-invasive, long-lasting medical procedure is a gentle and safe method that can be used on all skin and hair types. For those subject to rashes or ingrown hairs, this is an excellent option for hair removal. The high-energy producing laser targets the pigmentation in the hair shaft, which produces heat. This heat is transferred to the hair follicle, where it causes inflammation. Once inflamed, the hair follicle goes dormant; however, because heat is produced, there is some slight discomfort in sensitive areas of the body. Additionally, those with thick dark hair absorb more heat and may experience more discomfort. This usually occurs during the first treatment only since the hair becomes thinner and less dense after each subsequent procedure. This FDA approved procedure is safe and effective when performed by a trained professional. Costs for completed treatment vary. One can expect to pay anywhere from $500 to $1000 for facial hair removal, and $2000 to $3000 for leg hair removal. Laser hair removal normally requires a series of three to five treatments, administered over intervals of four to eight weeks. After completion, touch-ups may be required every few years. As technology continues to improve, laser hair removal will become increasingly popular. When you schedule your consultation, be certain the clinic of your choice performs laser hair removal under the guidance of a board-certified Dermatologist.